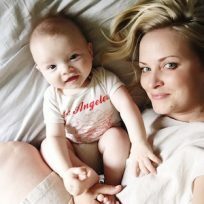 With spring break in full swing and my first plane trip with two kids behind me, I thought I’d share some things I have learned in my experience and from fellow parents out there on surviving trips with two kiddos in tow, and maybe even having a little fun along the way. Maybe. In a perfect world, it’s safest if your infant has their own seat on the plane and they are strapped into their car seat for the entire flight. But for most people, that is an expensive option that isn’t practical. Most of us take advantage of the “infant in arms” option. If you choose this option, make sure you are aware of your airline’s policy on proving your baby’s age. I have never had to show a birth certificate, but I have heard some airlines require them at check in. If you are flying alone with two kids, it is best to book an aisle and center seat, because you’ll need to get up with your children for bathroom visits and diaper changes. Also, for many people it works best to book flights for around bedtime. Most kids are much more likely to fall asleep on a plane if it’s later in the day or in the evening—unfortunately, my kids are amazing sleepers in their own beds but don’t sleep well in the car or on a plane, so this rule doesn’t work for us. Trust your instincts on what time you think is best for your own child. The absolute easiest thing is to arrange to have access to reliable gear like car seats at your destination. Sometimes you can rent them with a rental car or maybe you have a friend or family member you can borrow from. We bought a safe (but more affordable) car seat for our kids that stay at my mom’s house, so she has them installed in her car when she picks us up from the airport. If you need to take car seats with you, you can check them with your luggage (for free—all baby gear like strollers, car seats, and travel cribs can be checked for free on most airlines, but check with your airline to make sure) or gate check them. Checking them with your luggage is the easiest for you, since you don’t want to have to deal with them through the airport. But gate checking them is safer for your gear. Whenever possible, check your gear in their original packaging or in a designated travel bag. Also decide if you will need a stroller at your destination or if one will help you at the airport. If you have connections or are traveling alone with kids, a stroller is probably a must. I used my UPPAbaby Cruz stroller with piggyback board for my older son to ride on through the airport, making it much easier to get both kids where we needed to go. We also used UPPAbaby’s awesome travel bag when we gate checked it—if you register the bag and anything happens to your stroller in flight, UPPAbaby gives you a new one! Some other easy options are using an umbrella stroller for an older child and carrying your baby in an Ergobaby carrier (or your preferred carrier), or letting your older child walk (depending on their age) and using an umbrella stroller for your littlest one if they are big enough. I love an umbrella stroller that you can close with one hand—so important. Keep in mind that you will have to take your baby out of the carrier in order to go through TSA security, but it will come in handy on your flight. Some airlines let you wear your baby at takeoff and landing, and if they get fussy mid-flight (which they likely will), walking them up and down the aisle in a carrier is great for calming and helping them sleep. Little known secret: There is a family lane available in many US airports. It’s a great perk to flying with kids and is usually shorter and moves faster than the regular lines. So when you first step up to TSA, request the family lane. Have your ID and boarding passes easily accessible (but secured so you don’t lose them) in an outside pocket of your bag or in your pocket. When it’s your turn, put your tote in a bin, remove any babies or kids and fold down the stroller, pick up your smaller child, and have your older one put their suitcase up by themselves. Kids can keep their shoes on but you can’t, so slip off your shoes last and throw them in your bin. If you have any breast milk, water for the baby’s bottle or sippy cup, or liquid formula in your bag, you can keep it with you, but TSA will test it. It takes a few seconds and you’re set. Congrats—you made it through one of the hardest parts! 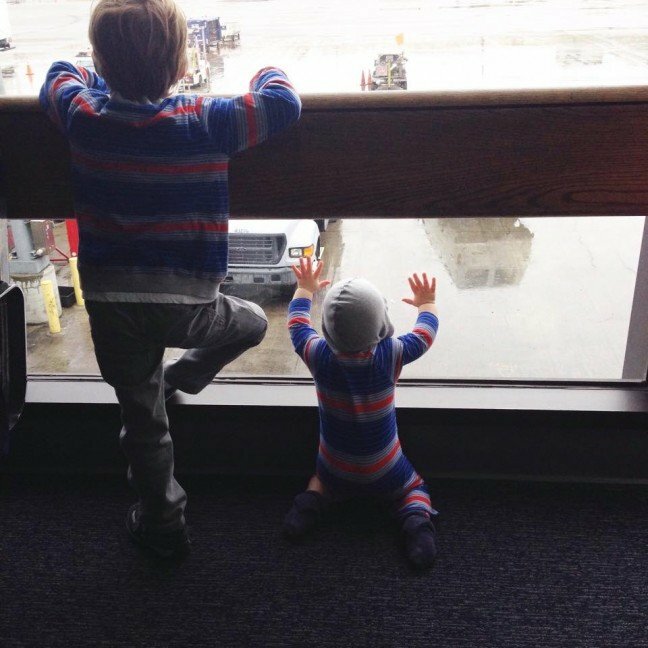 Once it is time to board, try to wait until the end to board so your kids aren’t on the plane any longer than necessary. This works especially well if you only have bags that go under your seat (since the overhead space always fills up) and if you have the aisle seat in your row so you don’t have to crawl over a stranger. The very first thing you should do when you get to your seats is wipe everything down with sanitizing wipes. Literally everything within reach of your kids needs to be wiped down—the germs on airplanes are beyond disgusting. So try to clean the seats, arm rests, windows, tray tables in front of you, seat belts, and anything else you see (like the window shade if you have a window seat). Pack a diaper changing caddy or a freezer-size storage bag with a few diapers and a pack of wipes. I really like using this diaper changing station because it makes traveling way easier since it holds wipes & a diaper and is a changing pad as well. When you do need to go into the airplane bathroom, bring your sanitizing wipes and wipe down (at minimum) the changing table and the wall surrounding it. Those things are never cleaned. My husband forgot to do this on our flight when changing a poo diaper, and three days later my baby developed hand, foot, and mouth disease. You’ll never convince me that he didn’t pick that up from the dirty changing table. Ugh. Most important piece of in-flight info: Don’t forget to nurse or give a bottle to your baby during takeoff and landing to relieve the pressure in their ears. A pacifier works too if your baby likes those, but I always time a feeding with takeoff and landing if I can. If your child is older, it may not bother them at all, but a sippy cup or fruit pouch can help. Have new toys to introduce on the plane. Babies love pulling small items out of a bag, and opening and closing things (even a pack of travel wipes with the plastic opening could keep them entertained for thirty minutes). A bag with a zipper is great. I love the books with the flaps—open, close, open, close all flight long. I also bought this play travel tray, which has toys velcroed to it, a zipper, pouch, etc. to keep babies busy, that attaches to the seat back in front of you; it kept my baby pretty busy for a while. I also like to have a snack handy for babies—Calvin absolutely loved these and ate on them off and on the whole flight. And my older son Charlie loves sticker books and watching movies on his iPad. And don’t forget a pair of kid headphones—the airplane can be quite loud, and it is hard to hear the iPad (and disturbing to other passengers) without headphones. I also pack snacks for him like crackers, fruit pouches, a banana—stuff he likes and that packs easily. I throw in a few things he doesn’t eat frequently, like fruit snacks or lollipops. I opt for convenient and entertaining food over healthy options when on the plane—it’s all about survival. The moment the pilot tells you that you are making your descent into your destination, you have cause to celebrate. You’re almost there. 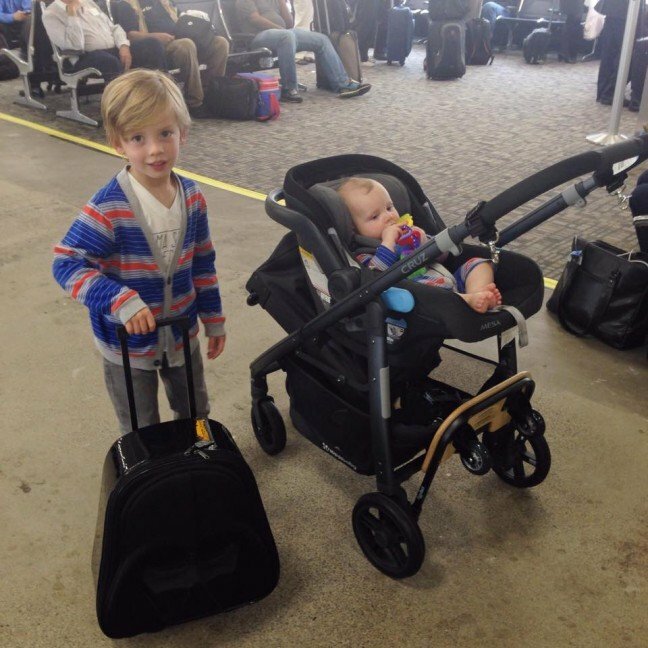 Once you deplane, don’t forget to grab your stroller or anything you gate checked in the jetway. Put your baby in the stroller to give yourself a much needed break and double check that you have all of your bags, belongings, and children before you leave the jetway. Hit the potty if necessary. Try to have someone meet you at baggage claim if you’re traveling alone, and if that isn’t possible definitely spring for a Smart Carte. You can’t deal with your kids, stuff, and baggage without it. Then take a deep breath and pat yourself on the back, because you made it! Don’t forget to try to enjoy the journey a little bit. Document it with some photos of your kids during the flight and after to remember that you can do it. You know, for next time! Happy travels.